Notes to the recipe: the tagliatelle are the most common homemade egg pasta in Italy, suitable to be combined with many sauces. 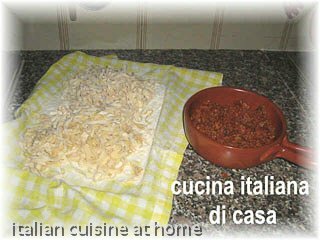 This is the classic Bolognese sauce recipe with ragout. It is the traditional recipe for lunch on Sunday and in many towns by walking in the morning on the streets you can smell the perfume of the ragout.